More than two thirds of Earth's surface is covered by water. If Earth's primordial water was boiled off from the intense heat during planetary cooling, where did Earth's abundant water originate? The origin of Earth’s water remains a mystery. Recent analysis of the composition of water sampled on comet 67P suggest Earth's water might not have come from cometary collisions (Life from Comet Collisions). Scientists suggest that one key to solving the mystery of Earth's abundant water is found in the D/H ratio or the flavor of water. The D/H ratio is the proportion of Deuterium (symbol D) to Hydrogen (symbol H). The ratio of these two hydrogen isotopes might provide clues to the origin of Earth's water. Deuterium is a form of hydrogen (i.e., hydrogen isotope) that has an additional neutron not present in common hydrogen. There are about 6,420 hydrogen atoms for every deuterium atom found in the world's oceans. Deuterium can replace hydrogen in water molecules. The properties of D2O differ from H2O (common water). D2O is called heavy water because it's 10.6% denser than H2O. D2O is also more viscous than H2O. The current opinion that science and poetry are opposed is a delusion. On the contrary science opens up realms of poetry where to the unscientific all is a blank. Those engaged in scientific researches constantly show us that they realize not less vividly, but more vividly, than others, the poetry of their subjects. 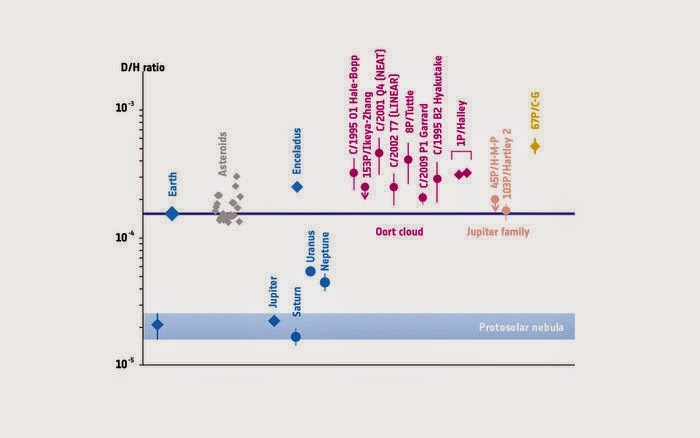 Analysis of the composition of water sampled on comet 67P, along with previous D/H analysis of other comets show a range of ratios generally containing higher amounts of deuterium than Earth. Of the 11 comets for which measurements have been made, it is only the Jupiter-family Comet 103P/Hartley 2 that was found to match the composition of Earth’s water. The D/H ratio of water sampled on comet 67P is three times greater than that of Earth's oceans. Scientists are are turning their attention to asteroids. Meteorites from asteroids in the Asteroid Belt have a closer match to the D/H ratio of water on Earth. Meteorites have a much lower water content than comets. However multiple serious of meteorite bombardments could have produced Earth's oceans. Water does not resist. Water flows. When you plunge your hand into it, all you feel is a caress. Water is not a solid wall, it will not stop you. But water always goes where it wants to go, and nothing in the end can stand against it. Water is patient. Dripping water wears away a stone. A Comet's Tale, shared on Google Plus by Brian Koberlein, 11 Dec 2014. Origin of Water on Earth, Wikipedia. Rosetta Fuels Debate on Origin of Earth's Oceans, European Space Agency, 10 December 2014.